Here we provide information about any solutions that might solve the Parking Problems. ​This page will be updated as we gather more information and more answers. SPJARA does not favour any particular solution over any other. On the Problems Page, we have done our best to list the problems as we understand them to be. Here on this Solutions Page, we want to publish as much detail as possible of any solutions that we know of or that are suggested to us by any resident. A Parking Permit Scheme (PPS) is the most obvious solution to parking problems that springs into everyone's mind - regardless of one's stance on parking. At the other extreme is the option of doing nothing. The reality is that any significant solution would almost certainly have to be based on some suitable flavour of Parking Permit Scheme (PPS). PPSs are the remit of Gloucestershire County Council - not Cheltenham Borough Council. 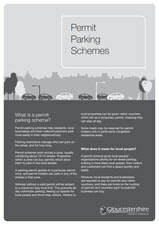 Gloucestershire County Council's leaflet describes Parking Permit Schemes. This is useful because it addresses many of the common questions and describes the operation of a typical scheme. It also provides valuable insight into GCC's opinion of the pros and cons of Parking Permit Schemes. In late October 2017, several SPJARA committee members held a meeting with key people from Gloucestershire County Council’s Parking and Highways Departments. Without a PPS, visitors struggle to find a space due to commuter and student taking any free spaces. It may (details to be checked) eradicate some large vans from parking. in some areas with an existing PPS, there are often some empty spaces all day that could be better used to provide parking for non-residents. This could prevent some displacement and thereby reduce the demand for a PPS in adjoining areas into which such displacement happens. Traffic movement could actually be increased because residents are more likely to use their car more instead of walking cycling etc, thereby possibly increasing pollution. 50 visitor tickets a year might not be enough for some people. Low-wage vacancies may be harder to fill and services may not be so well provided if workers cannot park. A decision to do nothing is another valid solution, but the following is worth bearing in mind. There is nothing to suggest that any macro solution such as more Park & Rides, more yellow lines etc. will relieve the pressure sufficiently or resolve the parking problems sufficiently - or within a reasonable timeframe. The process of getting a PPS approval from Gloucestershire County Council can, it seems take up to 2 years. Therefore, it would seem wise to at least get the ball rolling on a PPS process. Solution 3 - a Town-wide solution? Clearly, a town-wide solution that resolved the issue of the large number of commuters parking in our roads and streets would be good. This requires a long-term, town-wide approach, more Park-and-Ride locations, better cycling routes and a much more integrated public transport system. Yes, a great solution, but it is fair to say that such a holistic solution would take many years to implement.